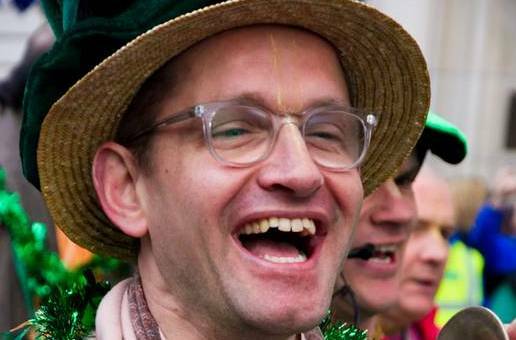 By Sandipani Muni Dasa For three years in a row, the Hare Krishna devotees from around London have been participating in the St. Patricks Day parade. Although it may not neccesarily be a Vaishnava festival, it is a great opportunity to share the Holy Name with the thousands of people who participate or watch the parade. Many people shared appreciation of the Hare Krishna’s at the parade. As exemplified in the video (link below) there were hundreds and thousands of people in awe at the energetic Harinama Sankirtan party. The constant street presence of the Harinama Sankirtan enthusiasts in London means the devotees in London are getting a name for themselves again, since the old days of ISKCON when street Harinama Sankirtan was most prominent. In addition to that, Srila Prabhupada’s books were being distributed while the parade was taking place so anyone interested in the Kirtan could take a book. There were children from the Bhaktivedanta Manor Gurukula dancing on the float, and many kirtan musicians playing in the middle, and Lord Jagannatha, Baladeva and Subhadra watching over the kirtan party. Those in a critical mindset may question why transcendentalists would be part of a Irish parade, but there was no compromise. The deities weren’t dressed in Irish Green outfits, there were devotees visible with Vaishnava dress and Tilak, Srila Prabhupada’s books were being distributed, and there were prominently displayed large Hare Krishna Mantra banners draped on either side of the cart, and the only words coming out of the speakers for 3 hours non-stop was the Hare Krishna Maha Mantra.